These downhill flows, known as recurring slope lineae (RSL), often have been described as possibly related to liquid water. The new findings of hydrated salts on the slopes point to what that relationship may be to these dark features. The hydrated salts would lower the freezing point of a liquid brine, just as salt on roads here on Earth causes ice and snow to melt more rapidly. Scientists say it’s likely a shallow subsurface flow, with enough water wicking to the surface to explain the darkening. Ojha and his co-authors interpret the spectral signatures as caused by hydrated minerals called perchlorates. The hydrated salts most consistent with the chemical signatures are likely a mixture of magnesium perchlorate, magnesium chlorate and sodium perchlorate. Some perchlorates have been shown to keep liquids from freezing even when conditions are as cold as minus 94 degrees Fahrenheit (minus 70 Celsius). 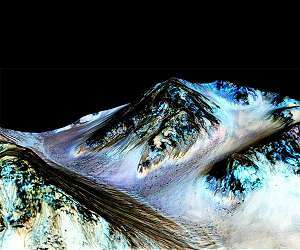 On Earth, naturally produced perchlorates are concentrated in deserts, and some types of perchlorates can be used as rocket propellant. There are eight co-authors of the Nature Geoscience paper, including Mary Beth Wilhelm at NASA’s Ames Research Center in Moffett Field, California and Georgia Tech; CRISM Principal Investigator Scott Murchie of the Johns Hopkins University Applied Physics Laboratory in Laurel, Maryland; and HiRISE Principal Investigator Alfred McEwen of the University of Arizona Lunar and Planetary Laboratory in Tucson, Arizona. Others are at Georgia Tech, the Southwest Research Institute in Boulder, Colorado, and Laboratoire de Planetologie et Geodynamique in Nantes, France.